Practices are every Wednesday evening at the Scout House subject to seasonal changes for outdoor practices. All kids welcome. No musical history required. Positions open for horn, percussion, colour party, banner and flag carriers and drill and acrobat team. 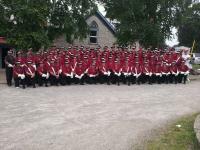 To carry on the 75 year tradition of Scout House by developing a 90 member childrens' band age 10 to 18. $20 Annual Fee covers instrument, uniform and world class instruction. Scout House Cadets require snare, quad and base drums, cymbals and b flat trumpets for their expanding band. If you have an instrument you do not need we would appreciate receiving it. We are a registered charitable organization. Canada's largest drum corps band.